In honor of Joe’s Birthday…………I decided to post about this cheesecake! He’s the sweet tooth in the family and chocolate is the way to his heart………HAPPY BIRTHDAY, BABE!!! This cheesecake might be one of the most delicious cheesecakes I have ever had! As my trusty followers probably already know, I’m not a huge chocolate lover and I’m not a fan or Oreos…like I won’t sit and eat Oreos with a glass of milk. 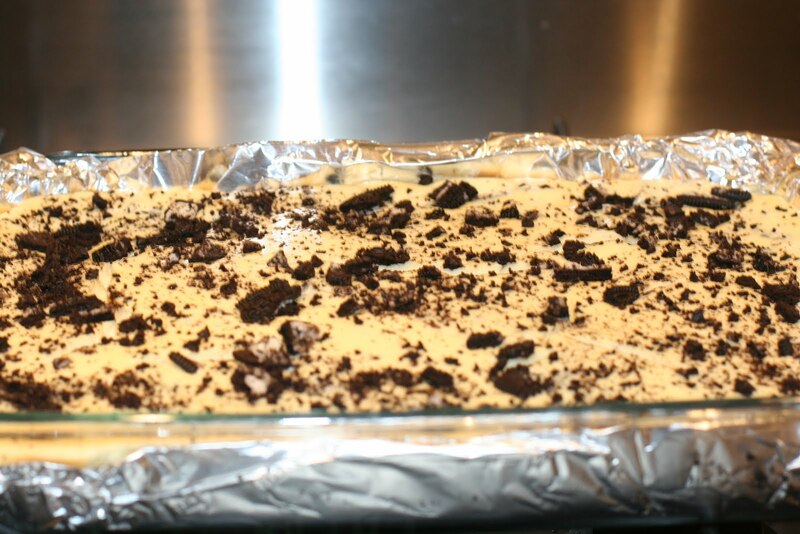 I do love cookies N cream desserts, and I LOVE this cheesecake and anyone who has had any….agrees! It’s always one of my old faithfuls and it’s perfect for any time of year….a BBQ, a Christmas party, a gathering of friends…..it will get you rave reviews!! It’s pretty simple to make and doesn’t take too much time to prepare…..the longest time is in the baking and cooling in the fridge! Make sure you make this cake with enough time for it to cool and settle (as with most cheesecakes). I honestly can’t remember where I got this recipe, it may have been a website or a magazine because I don’t think I got it from anyone in particular (and if I did……I apologize for not giving you a shout out). CRUST: Place 30 cookies in food processor; cover. Process until finely ground. Add butter, mix well. Press firmly into 13×9-inch baking pan. Beat cream cheese, sugar and vanilla in a large bowl with electric mixer on medium speed until well blended. Add sour cream; mix well. Add eggs, 1 at a time, beating just until blended after each addition. Chop remaining cookies. Gently stir 1-1/2 cups of chopped cookies into cream cheese batter. Pour over crust. Sprinkle with remaining chopped cookies. Bake 45 minutes or until center is almost set. Cool. Refrigerate 3 hours or overnight. Cut into 16 pieces. Store leftover cheesecake in fridge. TIPS: For easy removal line pan with foil, with ends extending over pan’s sides. Lift from pan using foil handles…..makes it easy to cut. I use my Kitchen Aid Stand Mixer….so smooth and fluffy!